Bohol’s primary asset is its population who are generally hardworking and educated. Bohol’s population has an average literacy rate of about 90 (NSO April 2001). Out of its 1.14 million population, about 716 thousand are in the labor force (NSO April 2002). With a good number of schools and training centers that aid in the education and training of its populace, Bohol’s labor force is one of the most highly skilled labor forces in the Visayas. Tagbilaran City, the provincial commercial center and capital of Bohol Province, is only 41 nautical miles away from the Regional Growth Center of Cebu. Bohol can serve as an alternative destination for the already burgeoning industry and manufacturing sector of Cebu. As planned, the northwest corridor of the province facing Cebu is identified as potential site for light manufacturing industries such as water bottling, manufacturing, food processing, coconut oil mills and other processing industries and as probable sites for subdivisions for expatriates from neighboring Mactan Island. Bohol is only an hour away by sea from Manila. There are direct flights/trips to Manila, Cebu and some major areas of the Visayas and Mindanao. With improved telecommunication facilities available in the province, Bohol can be easily accessed anywhere in the world. Generally flat and plain with only few mountainous areas, Bohol is suitable for massive cultivation of agricultural products. 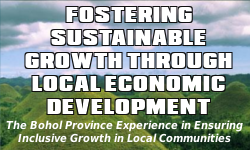 The Province is richly endowed with agricultural, fishery and mineral resources which, if properly managed and utilized, could bring significant development to Bohol. Its slopes also have good potential for commercial/urban and even industrial site development because of their natural drainage capacity. Some of these areas, particularly those preserved from degradation, can serve as habitats for interesting flora and fauna while some landforms are potential eco-tourism sites such as that of the Chocolate Hills of which Bohol is known. Bohol’s natural beauty also includes shoreline of white-sand beaches, pristine rivers, islands and sea straits teeming with voyaging whales and dolphins, colorful coral reefs and marine life, awesome variety of mangroves, rolling hills and caves, and its unique animal species such as tarsiers. Bohol is a diving wonderland. It is considered one of the world’s superior diving locations. Clear water, maritime artifacts and a variety of sea life provide and ideal diving environment. There is also high potential in the production of food crops, feed grains, root crops and commercial crops such as coconut, cassava and fruits. Similarly, the vast pastureland which is relatively undeveloped, could be further tapped in the production of livestock. Likewise, there is a high potential for commercial fishing with its very rich marine resources. Non-metallic minerals such as limestone, silica, clay and gravel abound in large quantities in Bohol. Raw materials used in cottage industries are also found abundant in the province like buri, nipa, rattan, bamboo and nito. Bohol is replete with a rich and colorful history starting from its pre-historic past to the Pre-Hispanic Dapitan Kingdom; to the time Bohol was under Spanish rule when the first international treaty of friendship was made between a Filipino and a foreigner through a Blood Compact, to when religious wars were staged by Boholano patriots against Spain; to events when Bohol was under the Japanese until the arrival of the Americans. Aside from its rich history, Bohol is bequeathed by its ancestors with an enviably resplendent array of cultural heritage, e.g., magnificent churches, imposing watchtowers, charming ancestral homes, unusual belfries, and artistic tradition of music, poetry, sculpture and dance. This wellspring of cultural historical assets, a significant part of the self-identity of Boholanos could be tapped as a springboard for eco-cultural/heritage tourism development.